Orange is the new black. 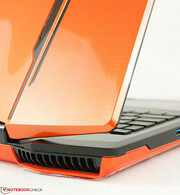 Is the distinctive design and lucent orange color enough for the Chimera to stand out in the crowded mobile gaming space? 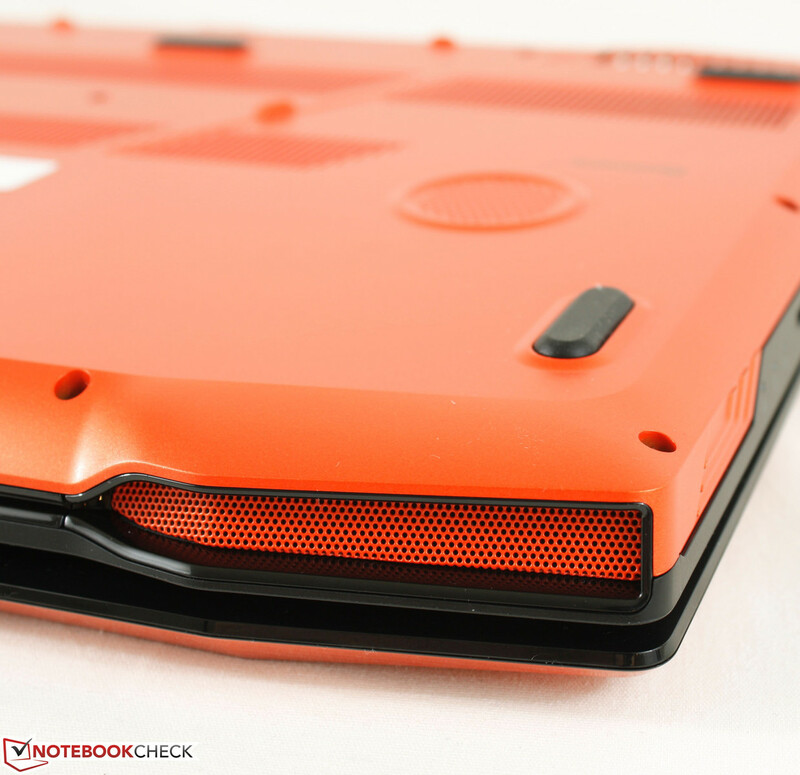 We dig deeper to find that this is more than just a flashy chassis. Moving away from the more common Asus, Clevo, or MSI shells is the iBuyPower Chimera CX-9 based on a Quanta design. This model stands separate from the reseller's Optiboost and Battalion series and is immediately identifiable by its eccentric outer lid and, of course, the bright orange paint job that makes this particular chassis stand out against the ocean of dull black and gray notebooks. 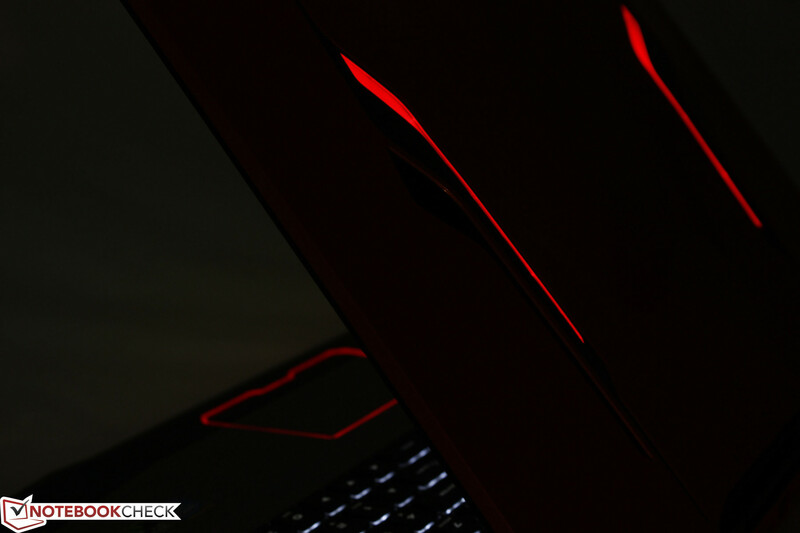 Dig deeper inside and we find that the 15.6-inch Chimera houses sufficiently powerful internals including its Core i7-4710HQ CPU, 16 GB RAM, GTX 860M GPU, multiple storage slots, and a 1080p display for Full HD gaming. Configurations start at around $1269 with a standard 5400 RPM drive, but our particular configuration on hand is equipped with dual 512 GB mSATA SSDs for a price point closer to $2000. 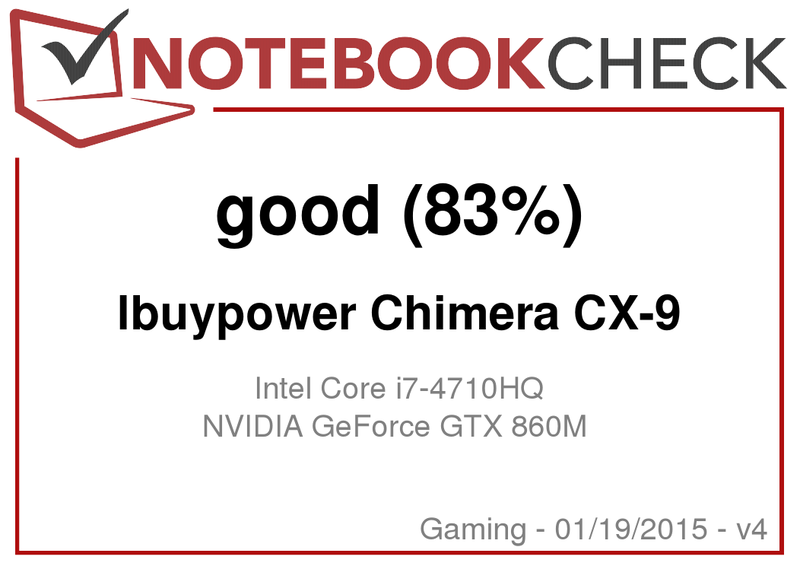 We run our usual hard numbers and benchmarks to check out just how well the Chimera holds up against some other popular 15-inch gaming rigs in the same price range. 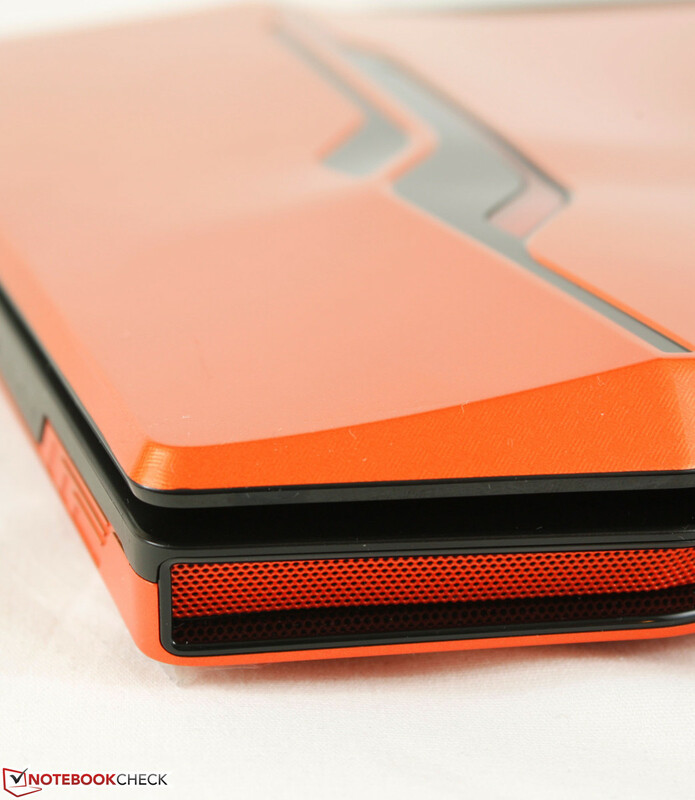 Let's get the design out of the way - The deep and bright orange coloring, glossy smooth finish, and curved construction of the outer lid is reminiscent of a supercar. 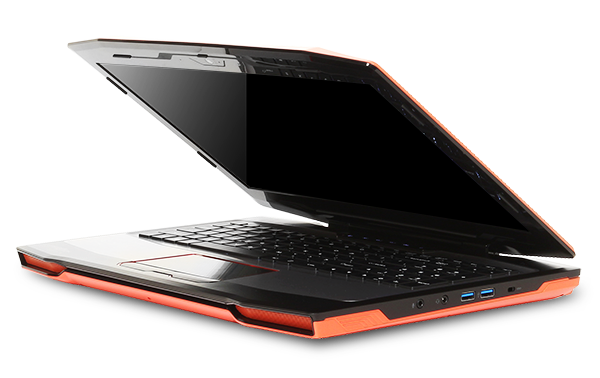 The Chimera looks fast as if it was built for speed and manages to avoid sloping or bulging rear ends that are common on larger gaming notebooks like the Asus ROG series. The checkerboard pattern underneath the glossy surface is difficult to notice from far away, but the detail adds both class and style when up close without being overly flashy. The black trims and orange LED lights add an additional layer to the gaming aspect of the model, though it would have been neat for the lights to glow or pulsate slowly as an indicator for charging when connected to an outlet. 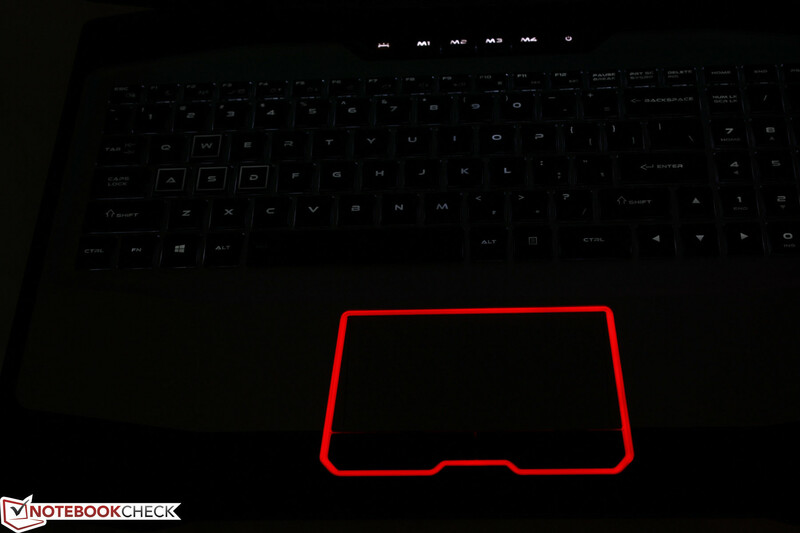 Even if the notebook was just jet black, we have to give the Chimera points purely from an aesthetic point-of-view. Elsewhere on the notebook, the orange aluminum maintenance panel underneath is matte in contrast to the lid, and the palm rests use both matte black plastic and brushed silver aluminum to complete the package. Similar to the Lenovo Y50 and its combination of different materials, the Chimera mixes up glossy, matte, and brushed aluminum surfaces of plastic and metal successfully without looking like a Frankenstein creation. 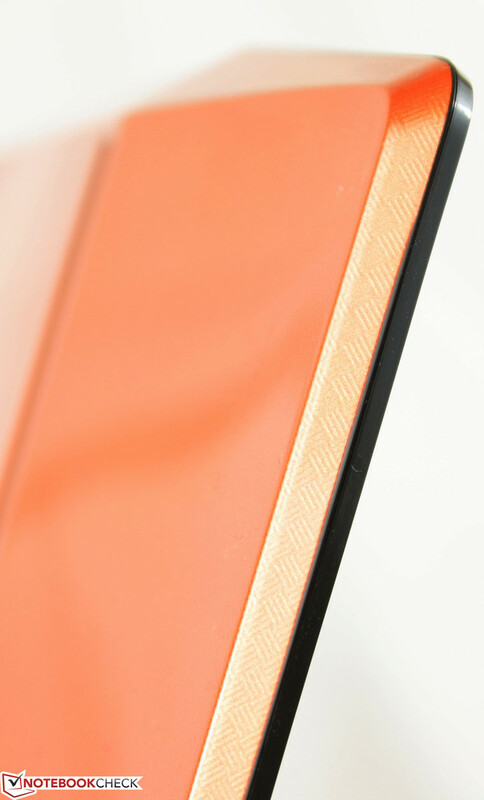 It's the antithesis to a unibody design and the drawbacks include higher potential for creaking, cracks, and crevices between where the different materials join. Fortunately and perhaps surprisingly, we noticed no such defects on the Chimera. Case quality is solid and a step above the Lenovo Y50, but still a few steps down from the lauded quality of a normally thicker Asus ROG G Series model. The Chimera shows good resistance to pressure when pushing down on the center of the outer lid or keyboard where most budget notebooks tend to show noticeable warping. Twists and turns of the base are also not an issue. 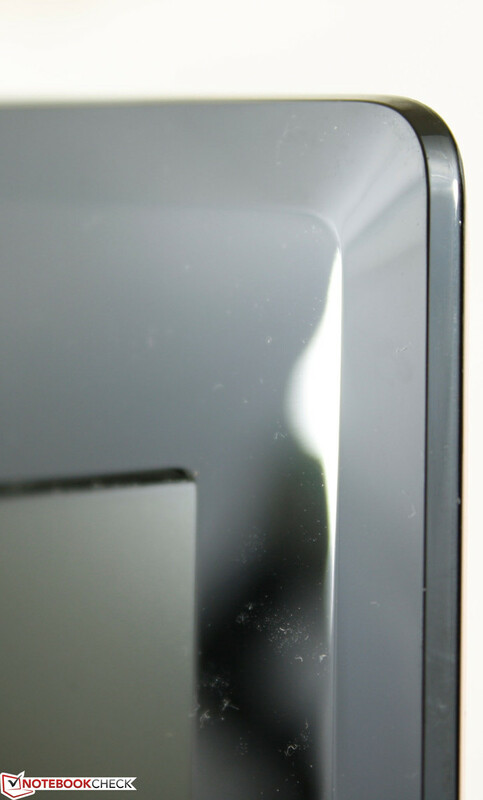 The single bar hinge is noticeably weaker in comparison as the display will rock back and forth a bit more aggressively than competing models when adjusting the angle. 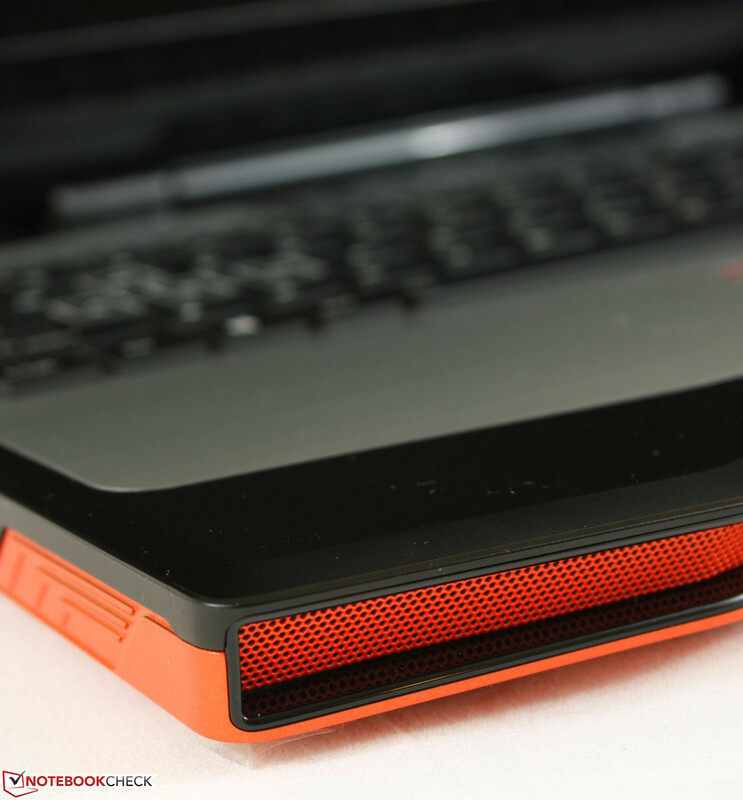 Nonetheless, it is rigid enough to prevent any shaking when typing or gaming up to its maximum angle of about 135 degrees. In terms of size and weight, the Chimera is a bit longer in depth compared to some of its 15-inch competitors in the graphic below and noticeably thicker as well, though not nearly as thick as the older generation MSI GT60 shells. The larger size means a heavier weight at just over 3 kg for the Chimera compared to 2 to 2.5 kg of the thinner MSI GS60, Acer V15 Nitro, Lenovo Y50, and Gigabyte P35W v2. 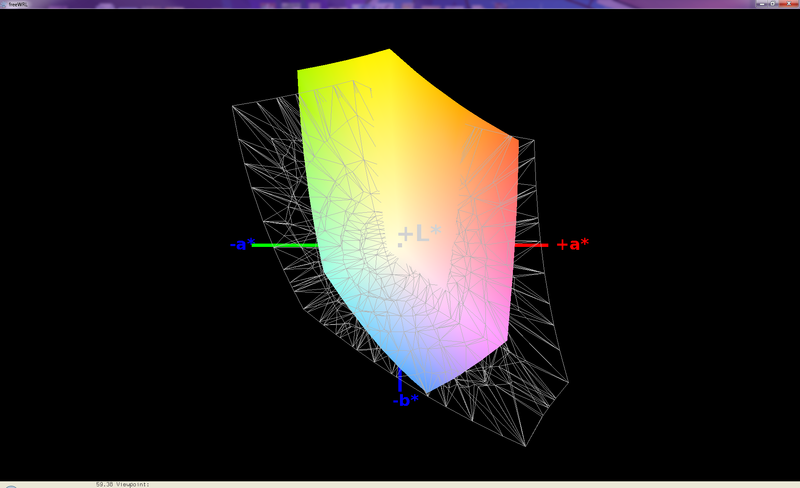 However, we find that the unique visuals and atypical concave outer lid hide the larger footprint quite well. Available interfaces include the usual and nothing out of the ordinary. Most notably, the Chimera offers both HDMI and VGA as certain competing models like the Acer V15 Nitro lack the latter. On the flip side of the coin, the Chimera lacks DisplayPort, which is available by default on the MSI GS60 and Asus GL550. 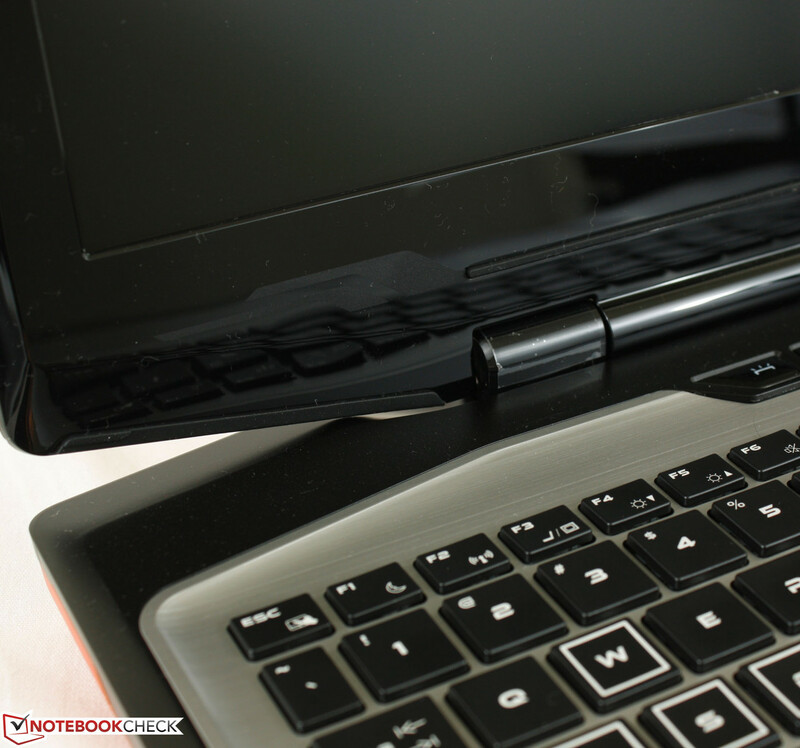 Otherwise, all ports are distributed rather evenly on the three sides of the notebook and positioning is favorable for both right- and left-handed users. 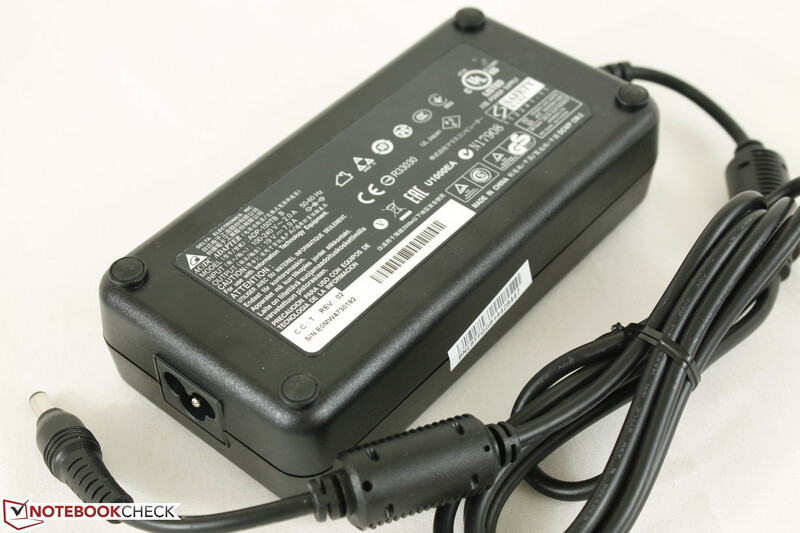 Bluetooth and WLAN are provided by a RealTek RTL8723BE module capable of up to 802.11n speeds. It is not dual-band, however, and only supports a 2.4 GHz network, which makes this a rather standard WLAN card that can be found on many budget notebooks, too. 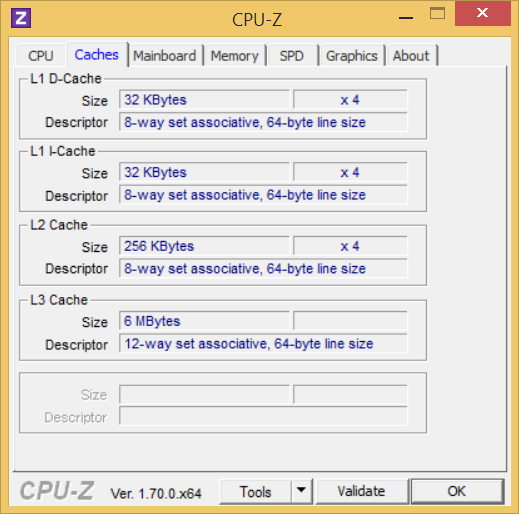 Users can configure an Intel 7260 instead for 802.11ac connectivity and speeds. 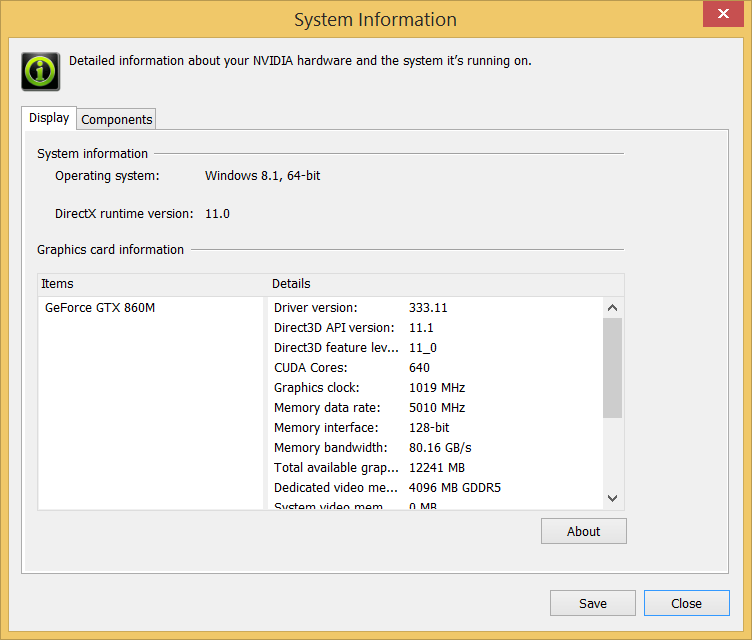 There are no WWAN or GPS options as expected from a gaming notebook. 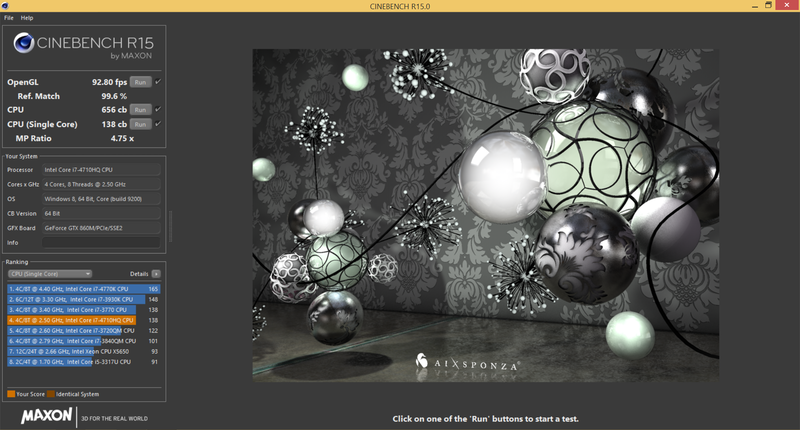 The Chimera is light on accessories out-of-the-box beyond the drivers and Windows installation discs with no proprietary connectors for specialized docks. There are, however, plenty of optional and generic accessories from iBuyPower ranging from gaming mice to media remote controls and carrying bags. Note that the included discs cannot be read on the Chimera without an external optical drive. The standard one-year limited warranty applies with unfortunately no extension options. Fortunately, iBuyPower throws in lifetime technical support and guarantees no defective pixels for an additional $30. 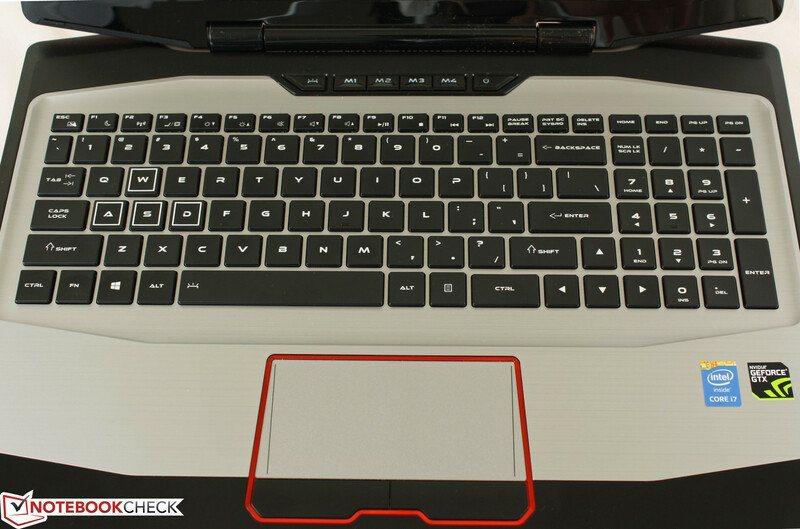 The Chiclet keyboard (34.5 x 10.5 cm) offers full-size directional keys and numpad and two brightness levels for the backlight. Typing feels excellent with actually little to complain as the keys have a long travel with satisfactory feedback. They are far from mushy with relatively quiet clatter as well. 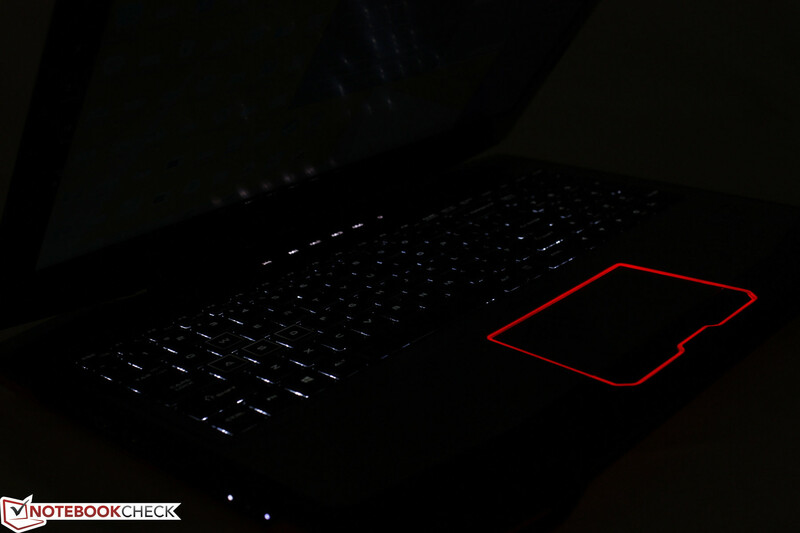 Jumping between the normally shallower keys on a standard Ultrabook and the Chimera feels like night and day. The top row of auxiliary keys sit adjacent to the Power button and provide 4 configurable macro commands for games and general use. 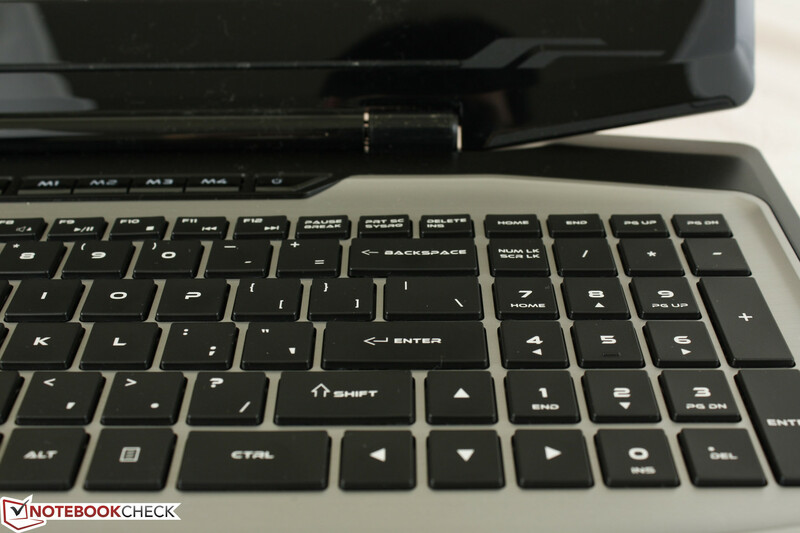 Not all gaming notebooks have these keys, so we can appreciate their inclusion on the Chimera. 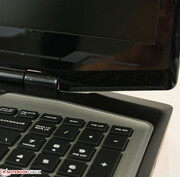 However, these keys are normally located on the left-hand side of the keyboard as a column like on the Alienware 18. This positioning makes them much more accessible for fingers on the WASD keys as opposed to their current position on the Chimera. 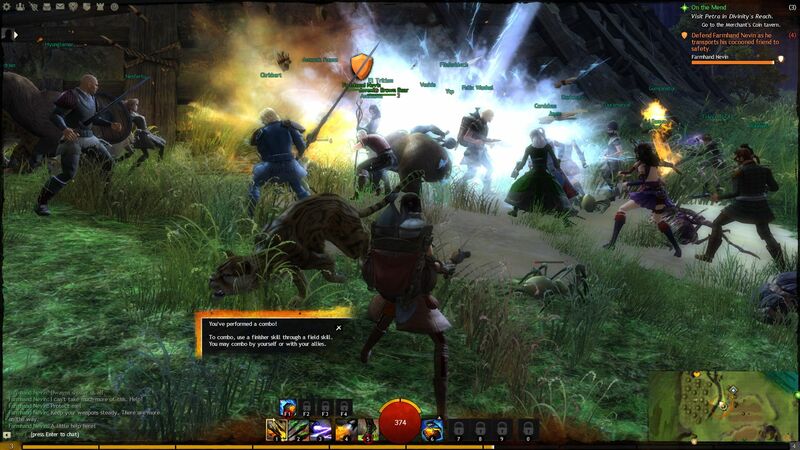 In games where split-second commands can be crucial, the macro keys here are a bit too far away for our liking. The touchpad here is relatively small at approximately 10.25 x 5.0 cm. 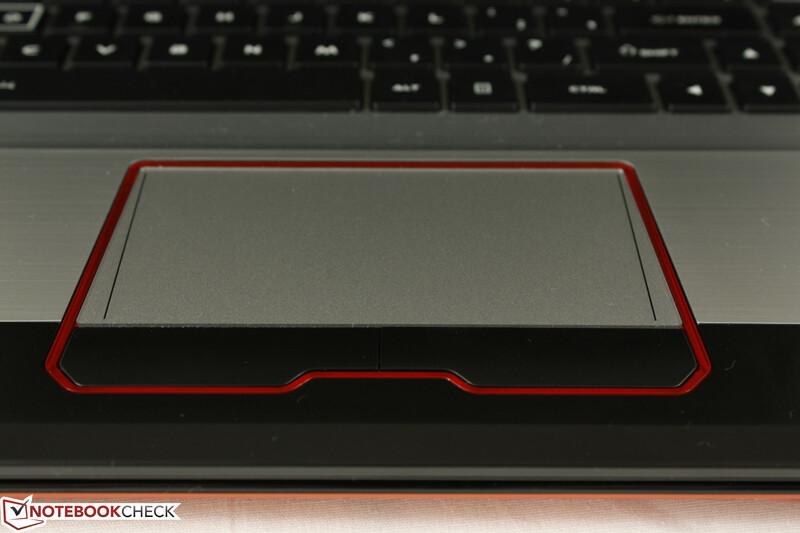 This is about the same as on the Gigabyte P25X v2 and noticeably smaller than the clickpads on the Acer V15 Nitro and Lenovo Y50. Furthermore, there is no default multi-touch support for pinch-zooming and scrolling. Users will also need to toggle the touchpad manually via a Function key as it will not automatically disable when typing or using an external mouse. Nonetheless, the surface glides smoothly and accurately for basic functions without any cursor jumps or delays. The two large dedicated mouse keys make up for their shallow travel by having very solid feedback and auditory "click" when pressed. 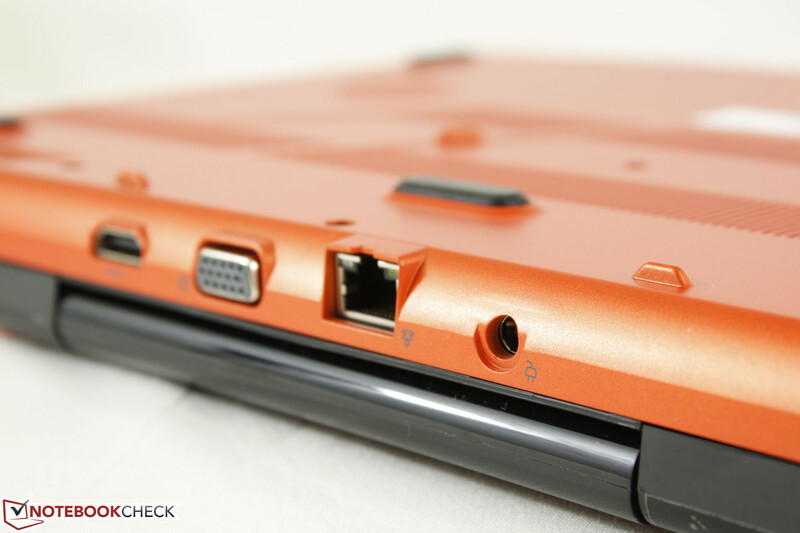 Like the touchpad above it, they register inputs reliably without any issues. The 15.6-inch display comes only in matte and in 1080p with no other options. 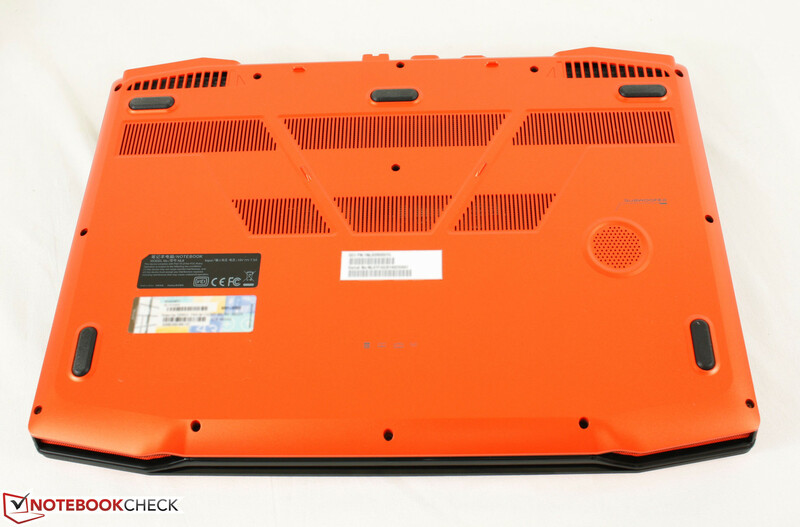 The AU Optronics AUO35ED display panel is currently only found on one other model in our database: The HP EliteBook 755 G2. 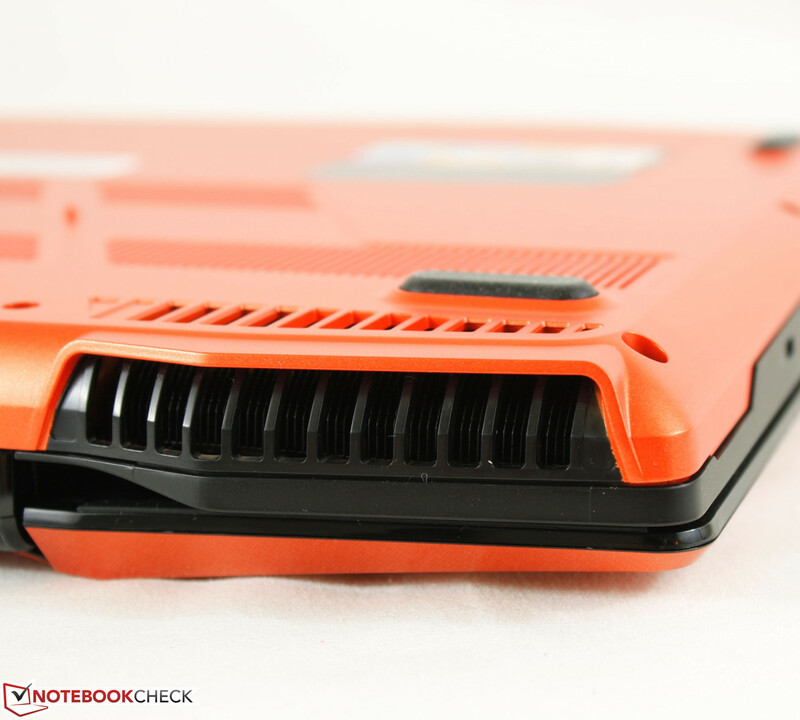 While EliteBooks are traditionally outfittied with high quality displays, the one on the EliteBook 755 G2 was found to be lacking. We see similar results here with the Chimera as the colors and measured contrast of about 500:1 are average and nothing special. On the bright side, maximum display brightness is very high for its notebook category. 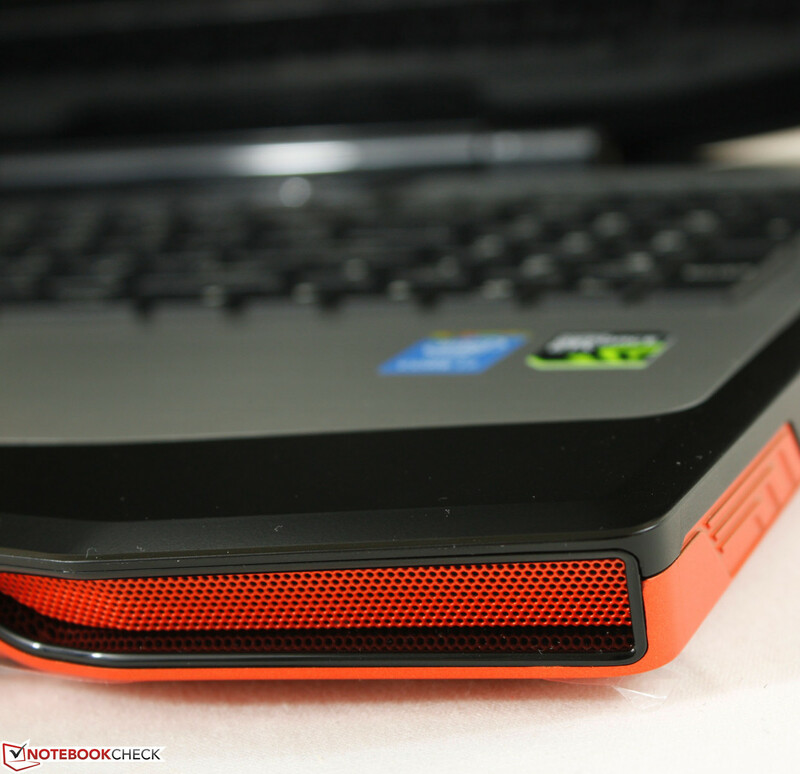 While competing 15.6-inch models like the Lenovo Y50 and Asus GL550 average about 220 and 300 nits, the Chimera reaches nearly 400 nits at its brightest quadrant. 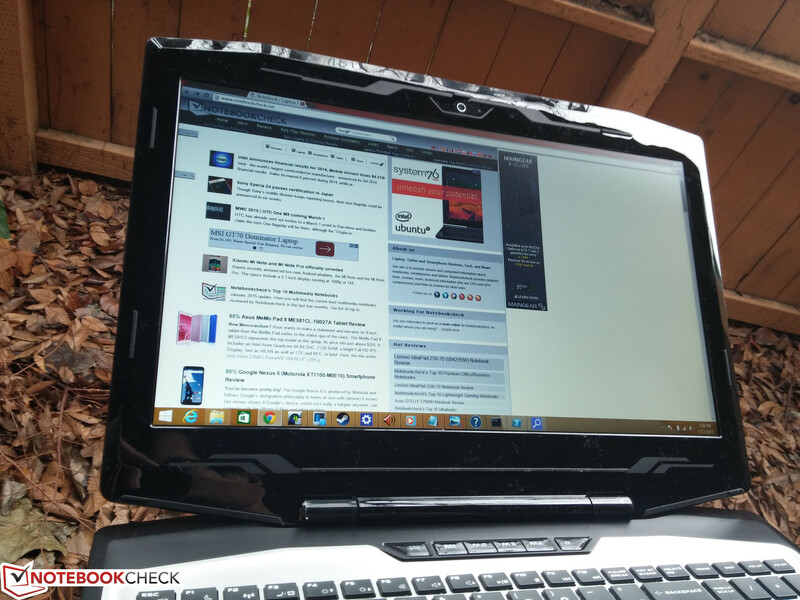 It's a welcomed advantage, albeit not entirely necessary for a gaming notebook as that high of a brightness is not normally needed in typical indoor situations. 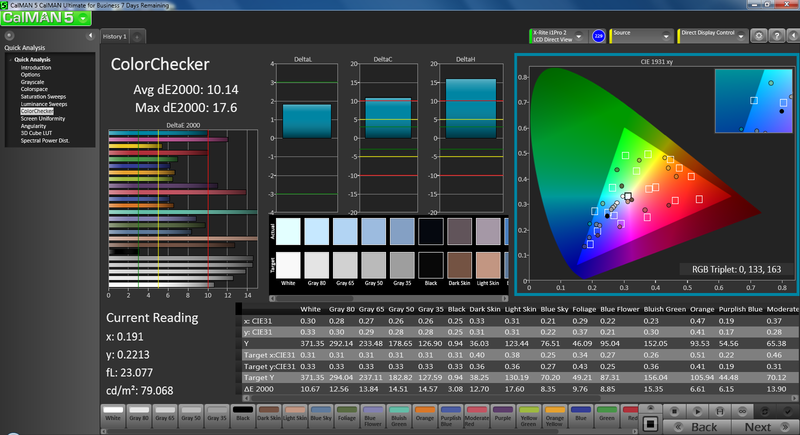 Color space reproduction is about 60 percent and 45 percent of the sRGB and AdobeRGB standards, respectively. This is typical for budget TN panels that are commonly found on inexpensive notebooks and a step below IPS panels in general. Color coverage from the Chimera display is not as wide as on a number of gaming notebooks either, such as the MSI GT72 or Acer V15 Nitro where higher quality panels are used. Regardless, the middling gamut has negligible effects on moment-to-moment gameplay where response times take priority. 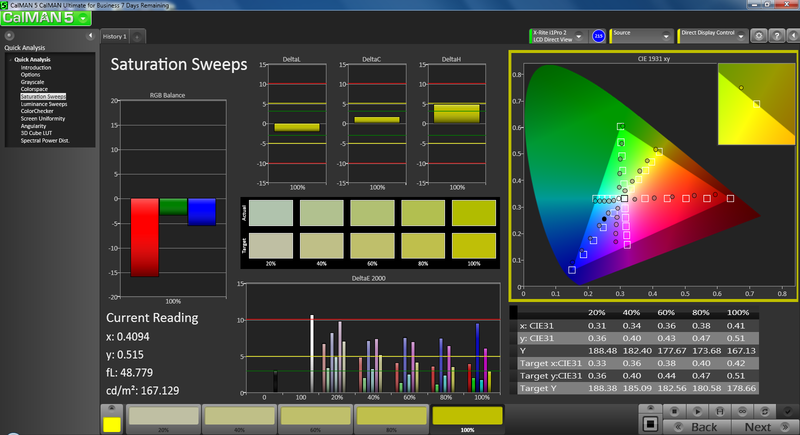 Further color analyses with an X-Rite spectrophotometer reveal generally inaccurate colors out-of-the-box. 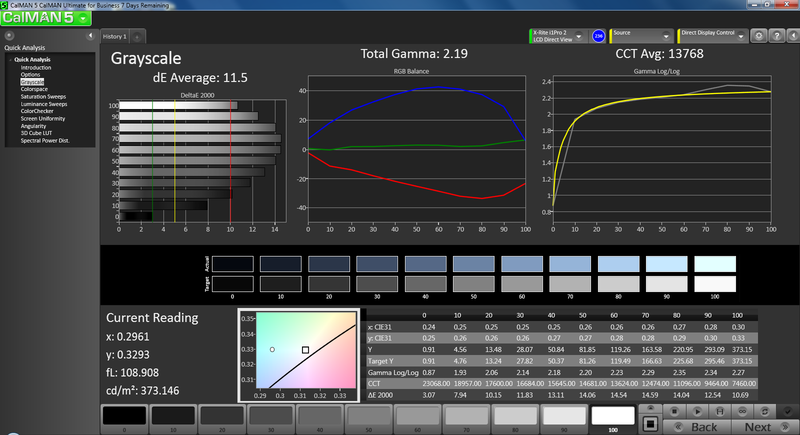 RGB balance is off while all colors become generally less accurate the lower the saturation level. Calibration will significantly improve colors and grayscale while bumping down correlated color temperature to warmer levels to increase color accuracy across all saturation levels. 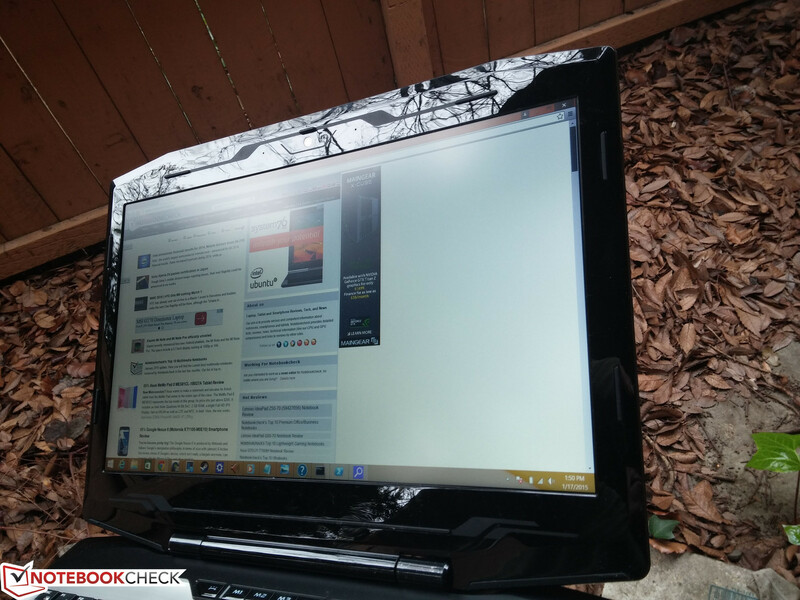 Outdoor visibility is better than expected compared to other gaming models due to the bright backlight. Maximum brightness will not artificially drop when running on batteries and the matte panel aids in deterring glare. But this is a heavy gaming machine no matter how you use it, so usability is still limited out of the household. Maximum brightness is recommended especially if under direct sunlight. 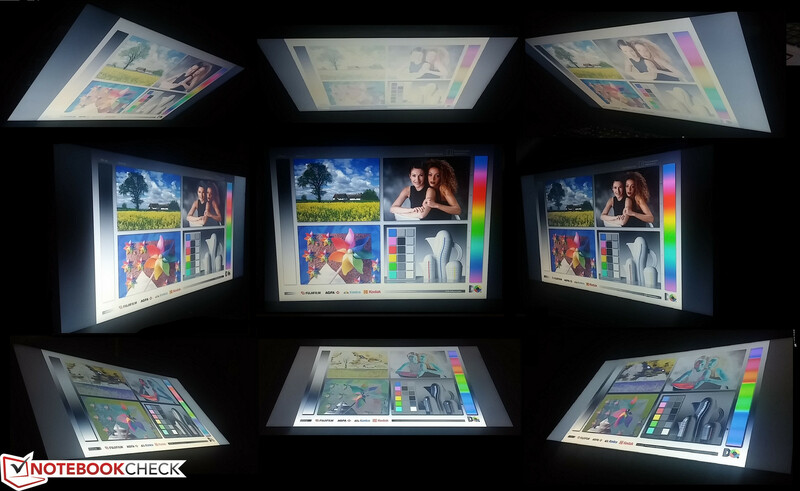 Viewing angles are standard for a TN panel, which means a narrow viewing window before colors and black levels invert or degrade. This is not an issue for the sole viewer and has no significant impact when gaming. 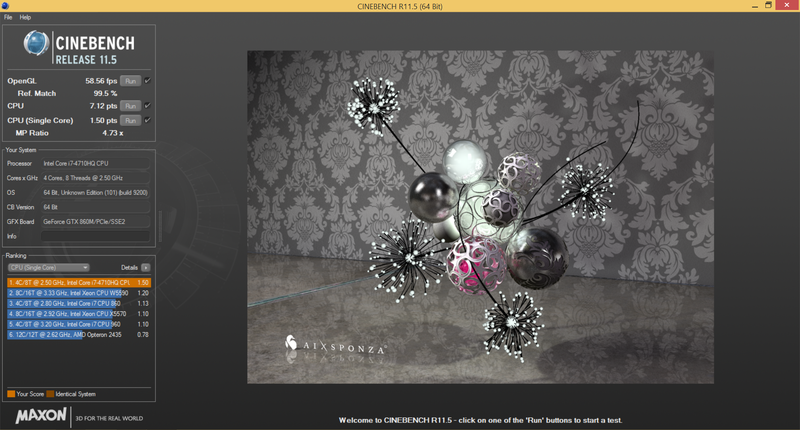 The current Chimera configuration only offers an i7-4710HQ CPU and GTX 860M GPU. 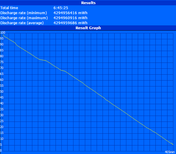 If idling on Power Saver mode, the CPU and GPU will run at 800 MHz and 135 MHz, respectively, to conserve power. 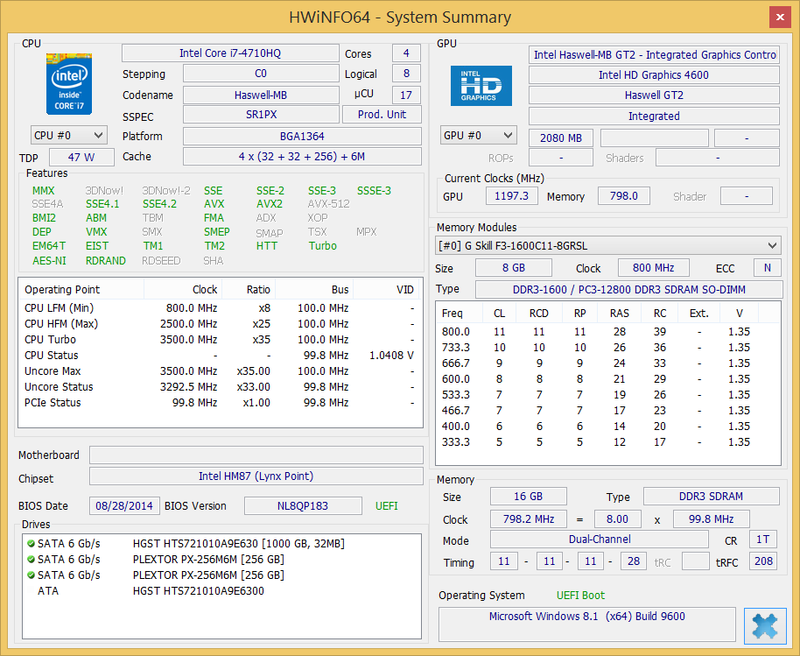 Optimus is supported for switching to the integrated Intel HD 4600 for even higher savings. 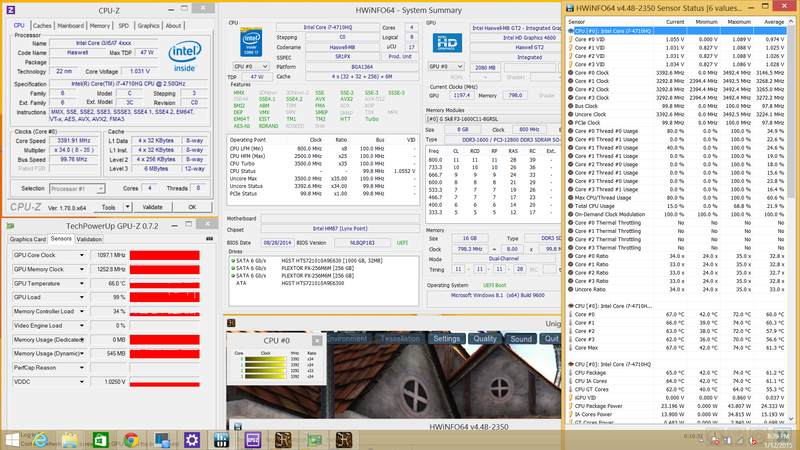 Otherwise, the CPU and dedicated GPU will run at or above their base clock rates via Turbo Boost. 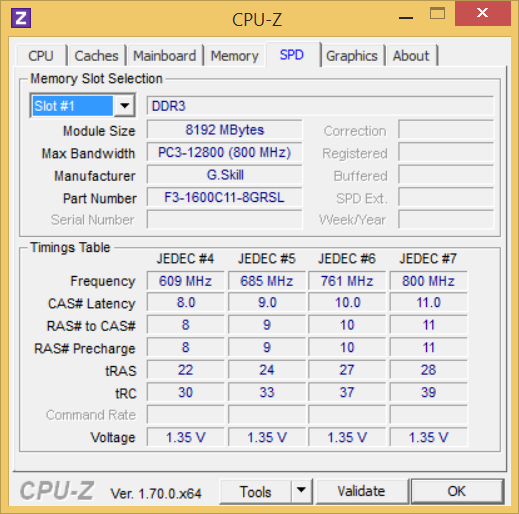 System RAM is provided by two DDR3 1600 MHz Ripjaws modules for a total of 16 GB, though iBuyPower offers G.Skill modules as well. There are only two SODIMM slots and both are occupied in this case. 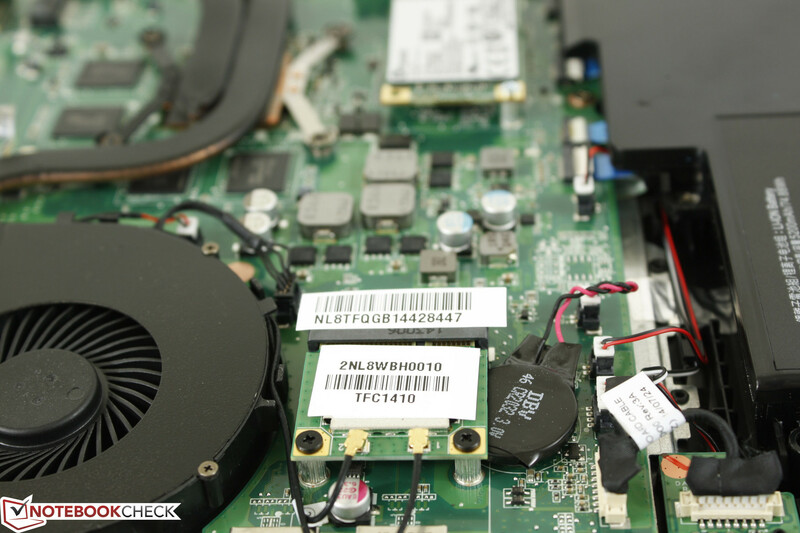 The RAM modules, both system fans and heat pipes, half-mini PCIe WLAN card, all three storage drives, batteries, and other major hardware features can be accessed by removing the maintenance panel underneath. 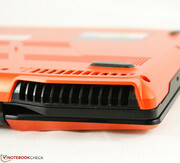 A Philips screwdriver, sharp edge, and some patience are required to remove this bottom cover. 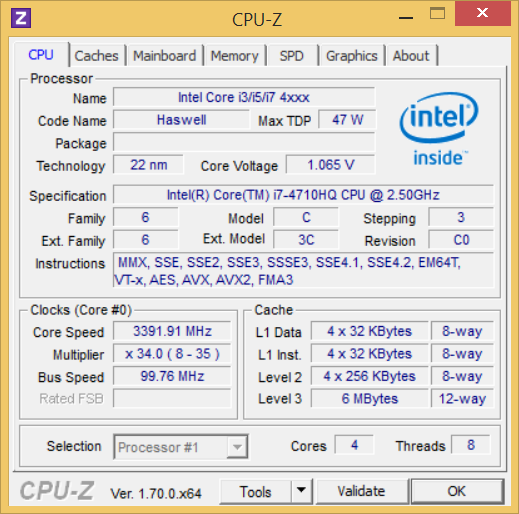 The high-end Core i7-4710HQ is a common CPU option on high-performance laptops. 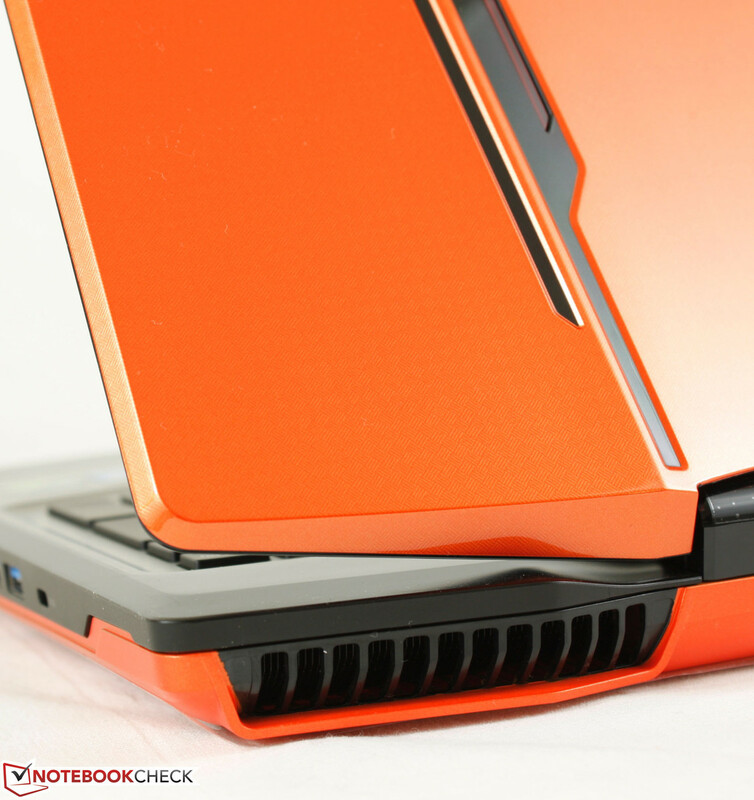 It is not normally available on Ultrabooks due to the relatively high 47 W TDP compared to the ULV Core ix models, so the i7-4710HQ is found almost exclusively on gaming notebooks with dedicated GPUs like the MSI GT72 and Aorus X7. 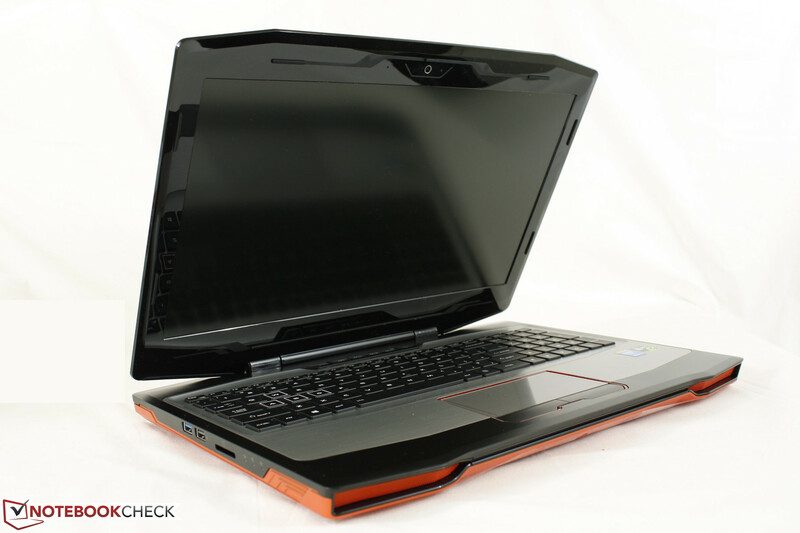 Synthetic CPU benchmarks place the Chimera alongside other gaming notebooks with the same Haswell core, so performance from the CPU has not been not artificially reduced in any way. Single-core performance according to Super Pi 32M is within 1 percent of the popular Core i7-2600K desktop CPU, while multi-core performance according to wPrime 1024m is within a couple of percentage points from the top mobile Sandy Bridge i7-2920XM CPU. 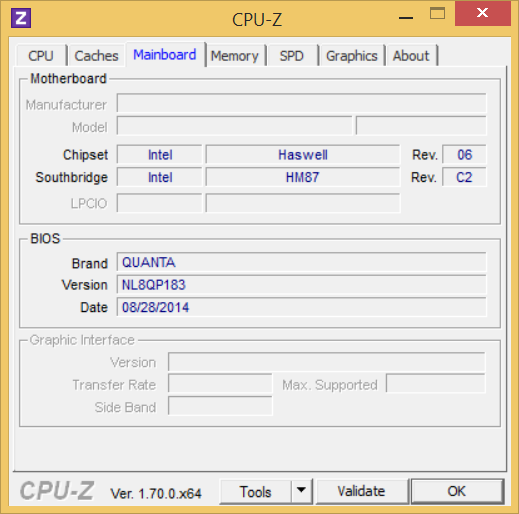 When compared to the previous Ivy Bridge generation, the i7-4710HQ is similar to the i7-3820QM while offering much higher integrated graphics performance under very similar power envelopes. 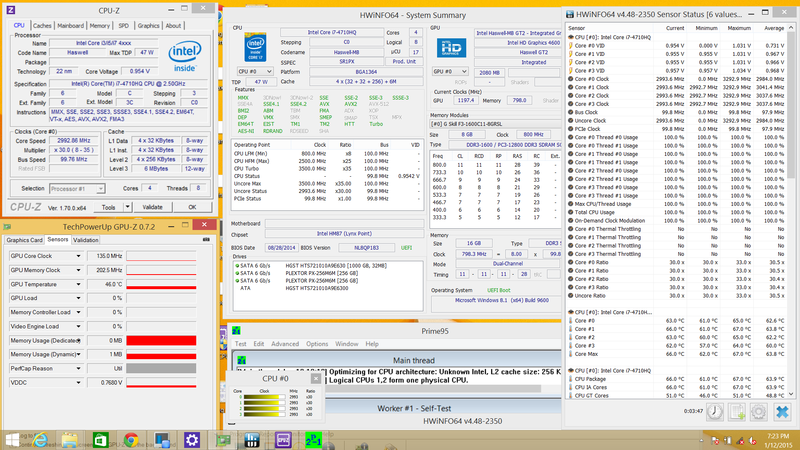 This CPU is far from a bottleneck and is certainly more than sufficient for gaming and other daily tasks. 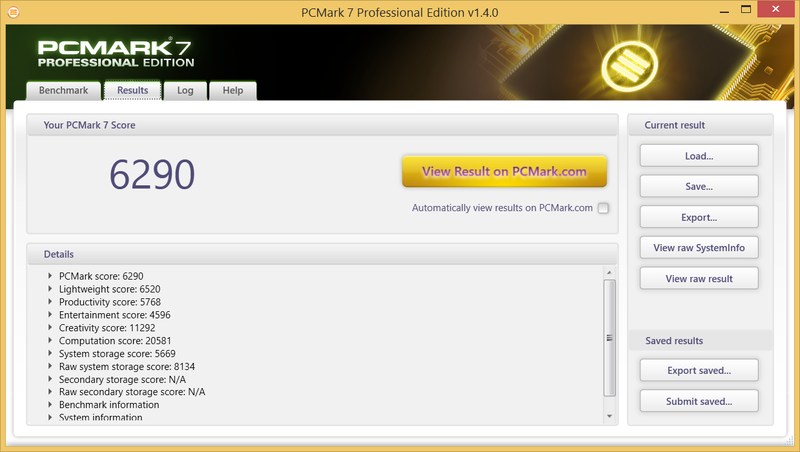 More information and benchmarks on the Core i7-4710HQ can be seen on our dedicated CPU page here. PCMark 7 places the Chimera next to the MSI GS60 and Asus G751, both of which have more powerful 870M and 880M graphics, respectively. This can be attributed to the fast RAID 0 setup on our configured model which has a large impact on general system performance benchmarks. Thus, our final score of 6290 points is only about 10 percent shy from our highest model: The Eurocom X8 and its GTX 980M SLI graphics. Subjectively, performance when navigating Windows and launching applications feels almost instantaneous and very Ultrabook-like. 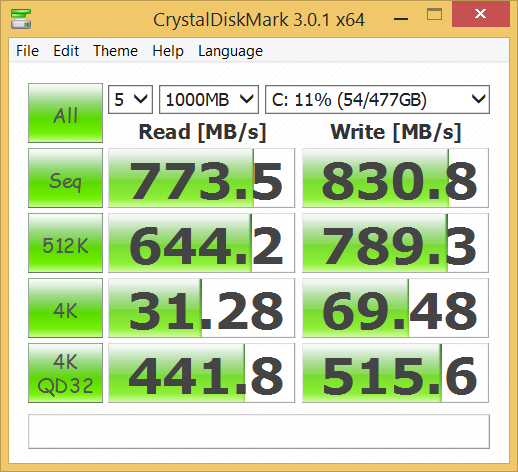 A quick Windows 8 Experience Index run shows that the CPU, GPU, and SSDs are quite balanced while the system GPU is the slight bottleneck. While CPU and GPU options are essentially nil on the Chimera, iBuyPower offers a wealth of storage options for its 2x mSATA and 1x 2.5-inch SATA III slots. Our configuration includes 2x 512 GB Plextor mSATA drives in RAID 0 with an additional 7200 RPM 1 TB Hitachi Travelstar for secondary storage. 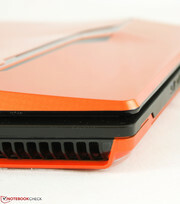 The wide storage capabilities should satisfy gaming enthusiasts who are looking for both high capacity and performance. 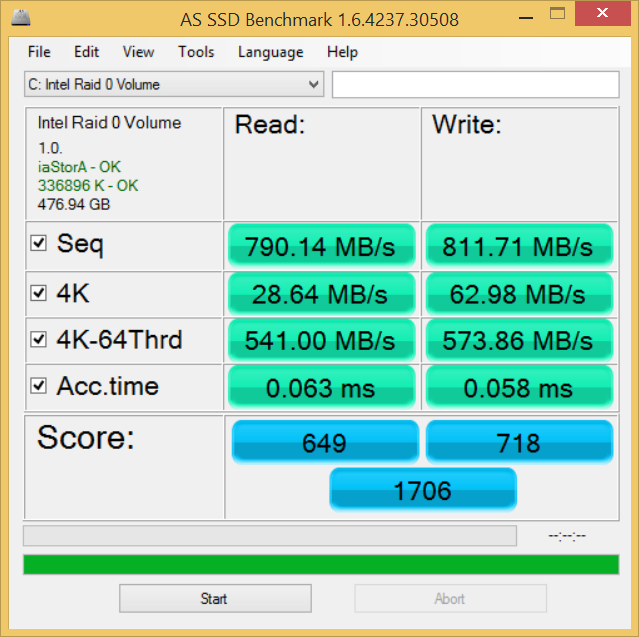 Performance from the RAID 0 Plextor drives outclasses the Intel SSD 510 Series in a similar RAID 0 setup and sits near the top of our HDD/SSD performance list. Write performance is notably very high for the Plextor drives at over 830 MB/s according to CDM, and is consistently faster than read performance in all tested cases, which is not common. We highly suggest at least one SSD and secondary HDD for additional storage instead of a single 5400 RPM HDD for both Windows and games. 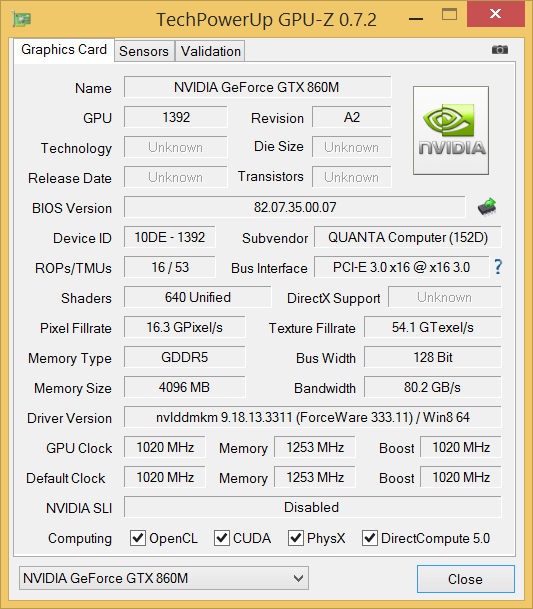 The GTX 860M is a common high-end GPU for gaming notebooks in the 15-inch to 17-inch range. 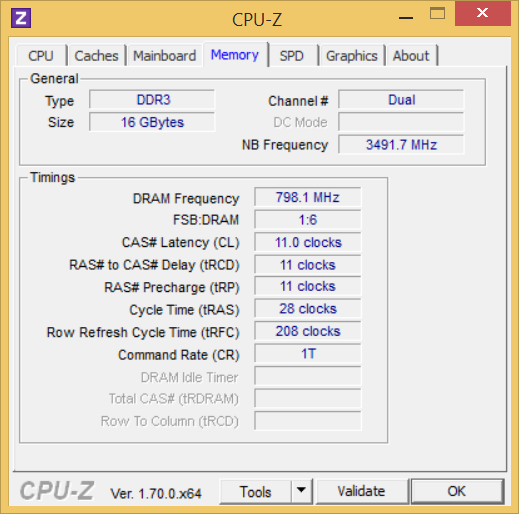 The Maxwell card operates at a core clock of 1029 MHz, which is even faster than both the base clocks of the GTX 870M and GTX 880M. However, Nvidia keeps overall performance in check by cutting down the memory bus of the 860M to just 128-bit, or nearly 50 percent narrower than the 870M. 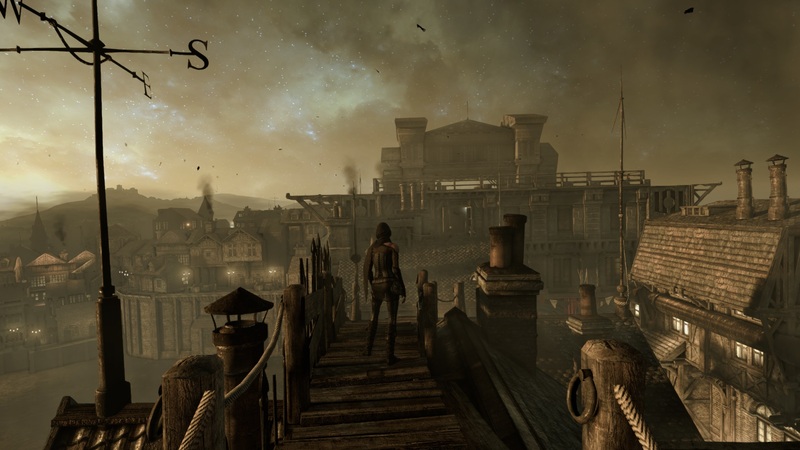 Most titles as of early 2015 will run at 30 FPS or higher at the native 1080p resolution on high settings, though more intensive titles like Thief or Ryse will require medium settings instead to remain playable at 1080p. This is where the narrower bandwidth takes its toll as the average GTX 870M can run these two games at about 6 FPS faster on Ultra settings compared to just ~25 FPS on the Chimera. 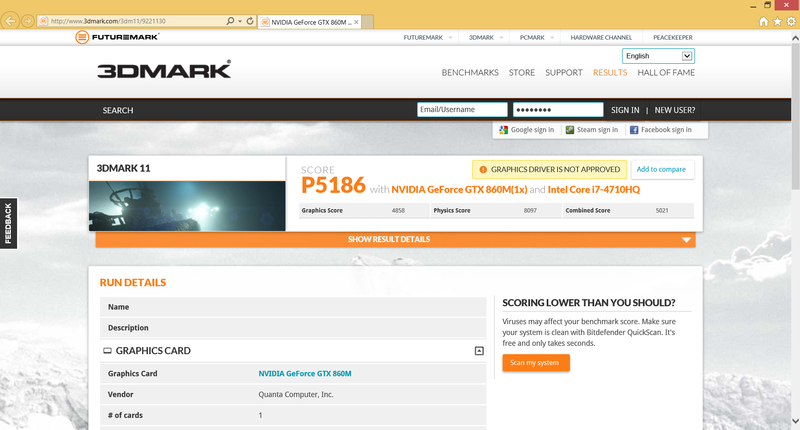 Synthetic benchmarks place the Chimera right where we expect it to be alongside other notebooks with the same 860M GPU like the Acer Aspire V17, Gigabyte P27G v2, and Scenker XMG P304. 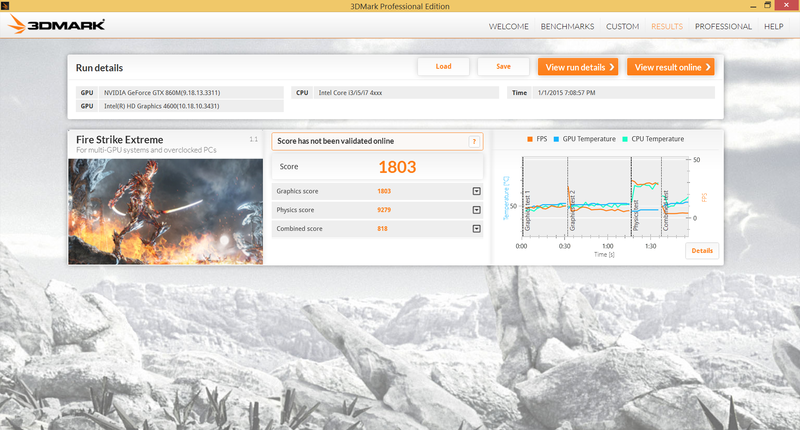 More benchmarks and technical information on the GTX 860M can be found on our dedicated GPU page here. We stress the Chimera with synthetic benchmarks whilst running HWiNFO, CPU-Z, and GPU-Z monitoring tools to observe for any stability or throttling issues. With just Prime95 active to stress the CPU, all cores will operate at a steady 3.0 to 3.1 GHz, or 200 to 300 MHz less than the maximum rated Turbo Boost for the i7-4710HQ. 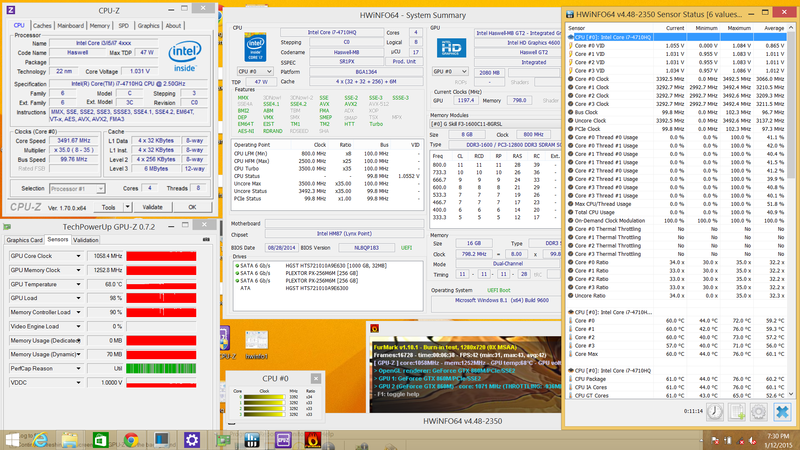 Core temperatures remain somewhat cool (for a mobile CPU) at under 70 degrees C. Similarly with just FurMark to stress the GPU, core clock will run at a consistent 1058 to 1084 MHz and plateaus at a temperature of 70 degrees C. This is a very slight yet comfortable boost above the base 1019 MHz core clock of the GTX 860M. 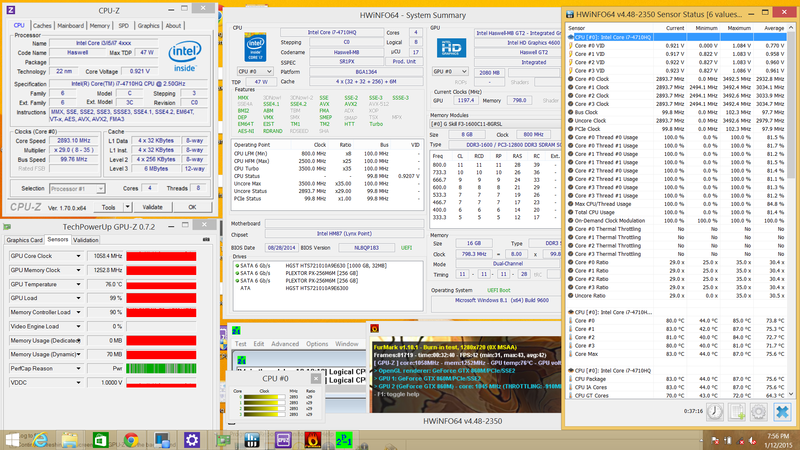 When stressed with both Prime95 and FurMark simultaneously, both the CPU and GPU experience small drops in clock rates. The CPU and GPU will run reliably at 2.8 to 3.1 GHz while the GPU at 1045 to 1071 MHz, so operating ranges shift down ever so slightly. 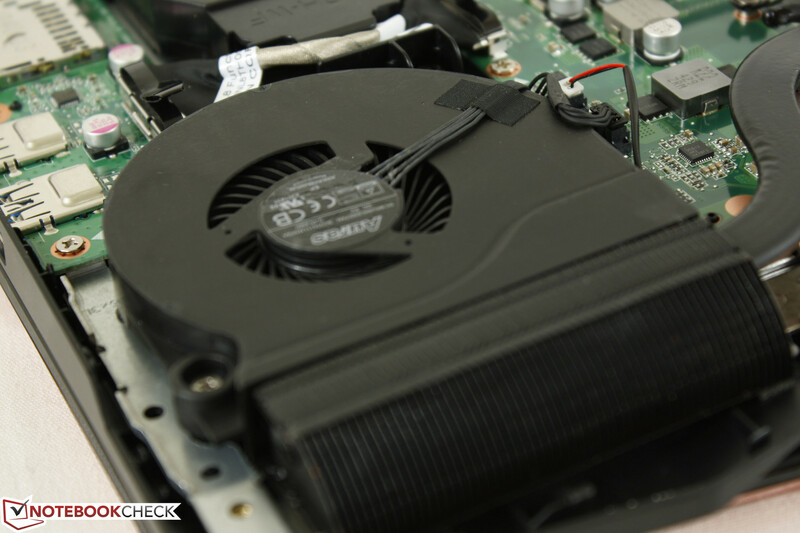 Temperatures reach as high as 80 degrees C with no observable hardware or stability issues. 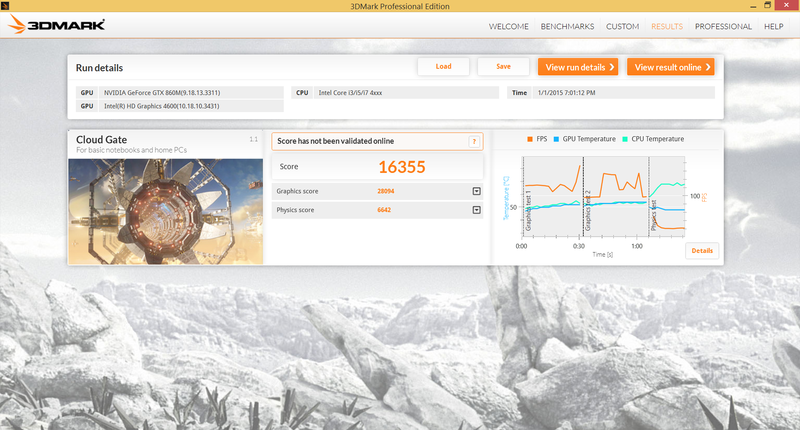 A quick 3DMark 11 run immediately following the stress test yielded very similar results across the board compared to a cold 3DMark 11 run prior to the stress test and suggests no real-world throttling issues. To better represent actual gaming conditions, we run Unigine Heaven 4.0 to stress the system instead of using the synthetic benchmarks above. 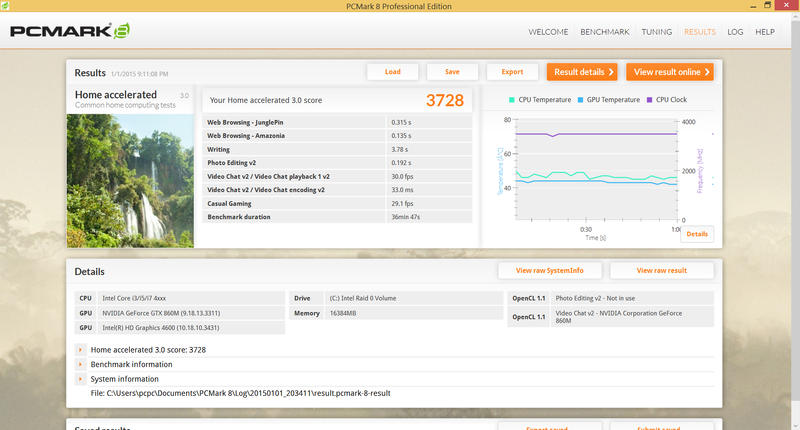 Under these conditions, the CPU and GPU will operate at a stable 3.3 to 3.4 GHz and 1097 MHz, respectively, which are faster clock rates compared to our Prime95 and FurMark tests. 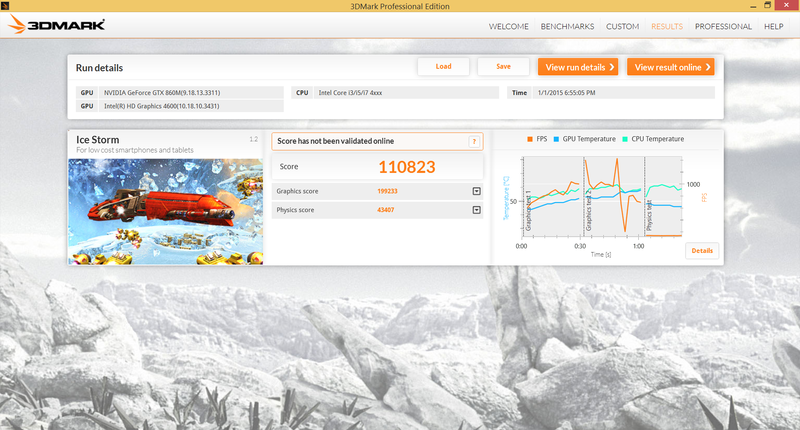 Running on batteries returned a 3DMark 11 CPU and GPU score of 7061 and 4890 points, respectively, compared to 8097 and 4858 points on mains. 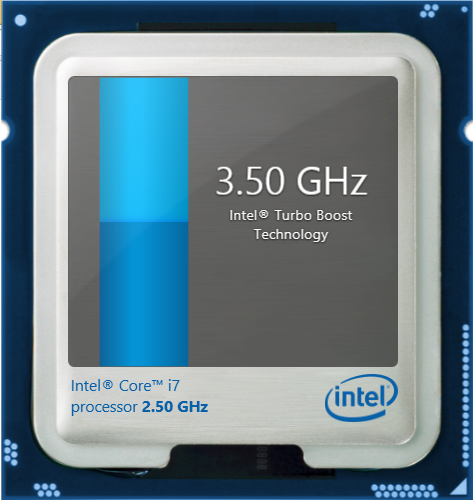 The lower CPU score is explained by the very reserved Turbo Boost when on battery power as the CPU can be observed operating at its base 2.5 GHz clock much more frequently. 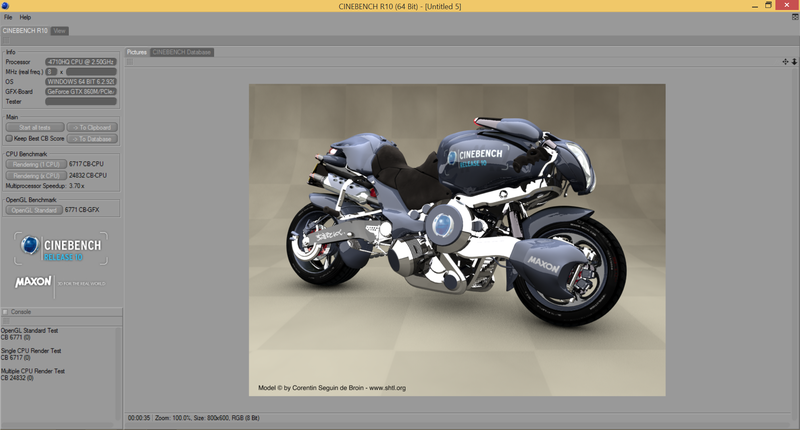 Thus, users running CPU-intensive tasks may want to connect to an outlet to get the most out of the Chimera while GPU-intensive tasks feel much less of an impact. The dual 50 mm system fans are generally quiet at about 33 dB(A), though they never completely idle and will always be audible under quiet ambient conditions. 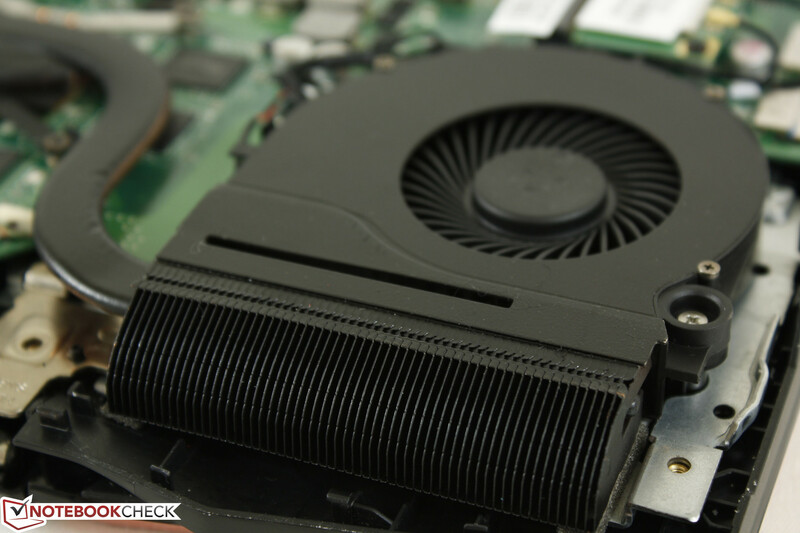 Unfortunately, it doesn't take much to bump fan speeds up higher to 38 dB(A) as browsing the net or simply launching programs have a high chance of increasing system noise for at least a short while before falling back down to its base level. Gaming will increase fan noise even higher to a consistent 43 dB(A) to 45 dB(A) range as is common on high-end gaming systems of this class size. 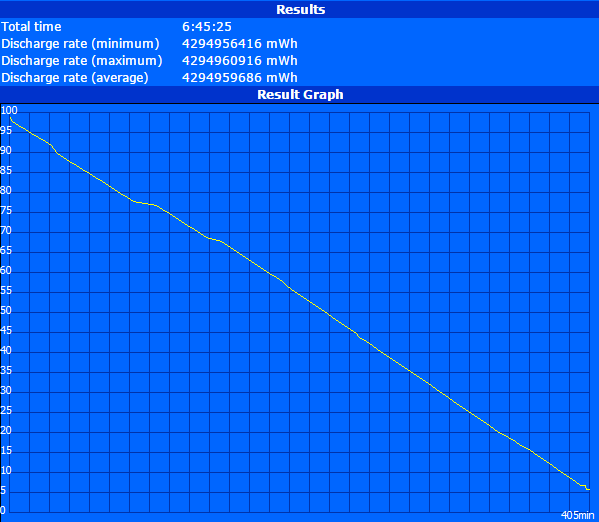 Maximum stress will bring the system slightly louder up to 47 dB(A), though this is unrepresentative of real-world use. Idling surface temperatures are flat on the keyboard and palm rests as expected, but the gradient is much steeper on the bottom side of the notebook where we measured a difference of almost 9 degrees C between the coolest and warmest spots. This is simply due to the fact that this particular hot spot is directly above both system heat pipes and is right between the CPU and GPU, so any rise in temperature is quite concentrated to this region. Surface temperatures after maximum load for over an hour demonstrate the concentrated waste heat on the bottom rear of the Chimera. The front of the notebook remains quite cool no matter the workload, which contrasts many superthin gaming designs like the MSI GS60 or Aorus models where almost the entire notebook experiences a more even rise in temperature. 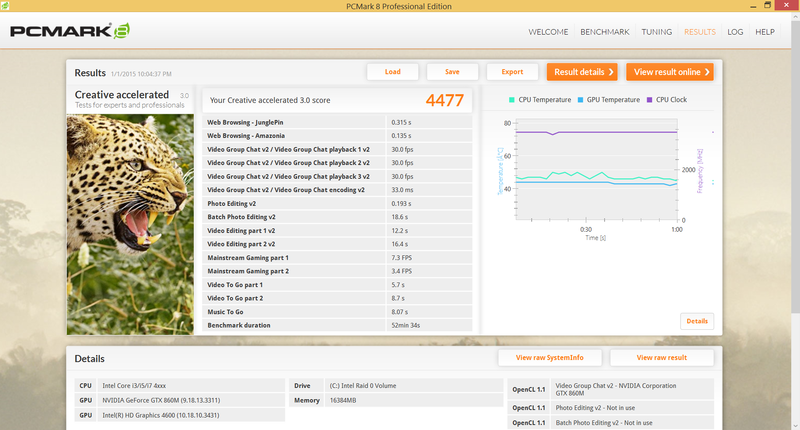 Our measured maximum of about 44 degrees C is very good compared to the Y50 or Acer V15 Nitro with the same GTX 860M GPU. The keyboard surface does warm up when the system is under stress, but the side with the WASD keys remain much cooler than the opposing side. Users should not feel any temperature-related discomfort when using the Chimera on a flat desk. (+) The average temperature for the upper side under maximal load is 31.8 °C / 89 F, compared to the average of 32.9 °C / 91 F for the devices in the class Gaming. 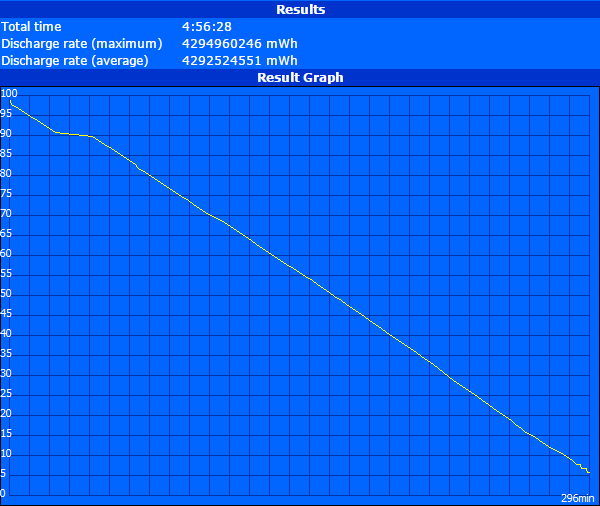 (±) The average temperature of the palmrest area of similar devices was 28.7 °C / 83.7 F (+1.9 °C / 3.5 F). The stereo and subwoofer 2.1 setup here is common amongst gaming notebooks. Even so, bass is still lacking on the Chimera and this becomes more apparent on louder volume settings. Fortunately there are no vibrations or audible static even up to the maximum setting. 3.5 mm and SPDIF external solutions are available for better sound quality. 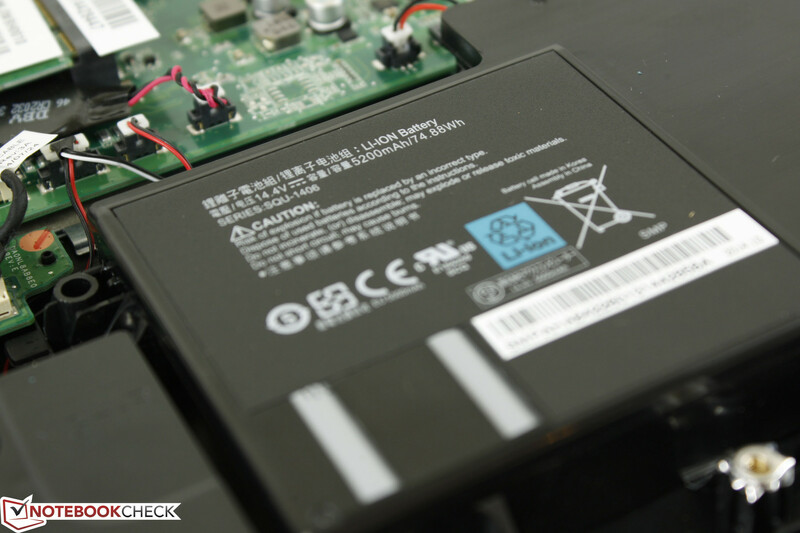 The integrated 74 Wh battery pack is high in capacity compared to the Lenovo Y50 (54 Wh), Asus GL550 (59 Wh), and Acer V15 Nitro (52 Wh). 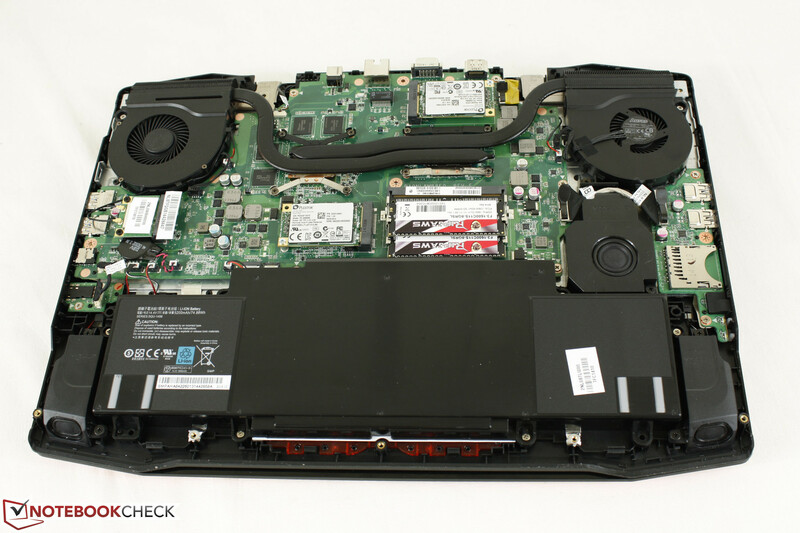 Gigabyte models and even larger gaming notebooks like the Eurocom X3 have similar capacities in the 70 to 80 Wh range, so it's welcoming to see the same here on the Chimera. Does the large capacity translate to longer runtimes? 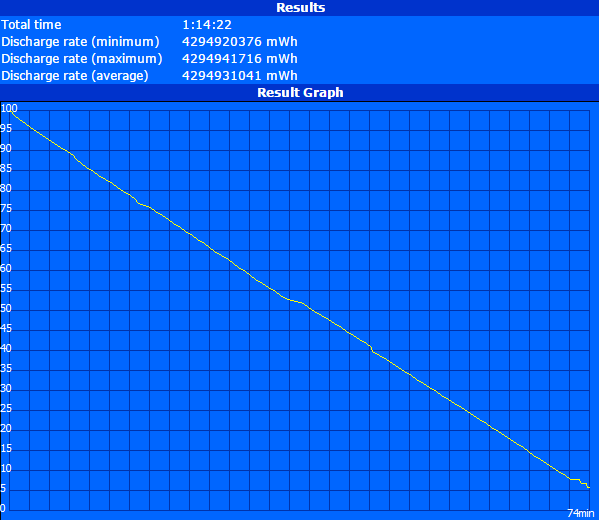 Not necessarily in this case as the Lenovo Y50 returns longer idling and load runtimes despite its smaller battery. 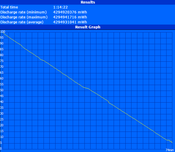 On the other hand, runtimes compared to the Asus GL550 are much longer by well over an hour in our standard WLAN test. 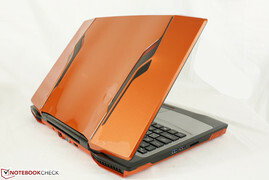 In general, users can expect at most 5 hours of constant use on the Chimera when surfing the web and with integrated graphics enabled, which is slightly above average for newer gaming notebooks equipped with Optimus. Intensive gaming is still limited to about an hour and a half. We jumped in on the Chimera with fears that it would offer little beyond its race car looks, but it honestly offers respectable hardware under the hood. The chassis feels sound despite the use of various glossy, matte, plastic, and brushed aluminum materials and the keyboard is surprisingly comfortable to type on. 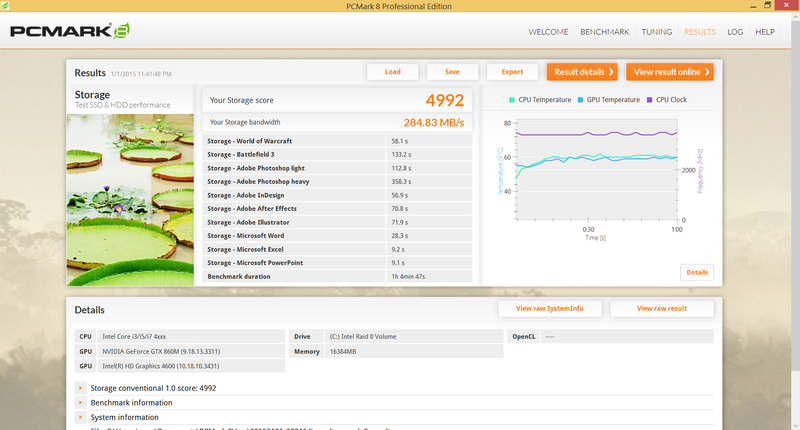 Turbo Boost performance is excellent and the multiple storage options and RAID capabilities give the notebook longer legs down the road for upgrades and versatility beyond just gaming. 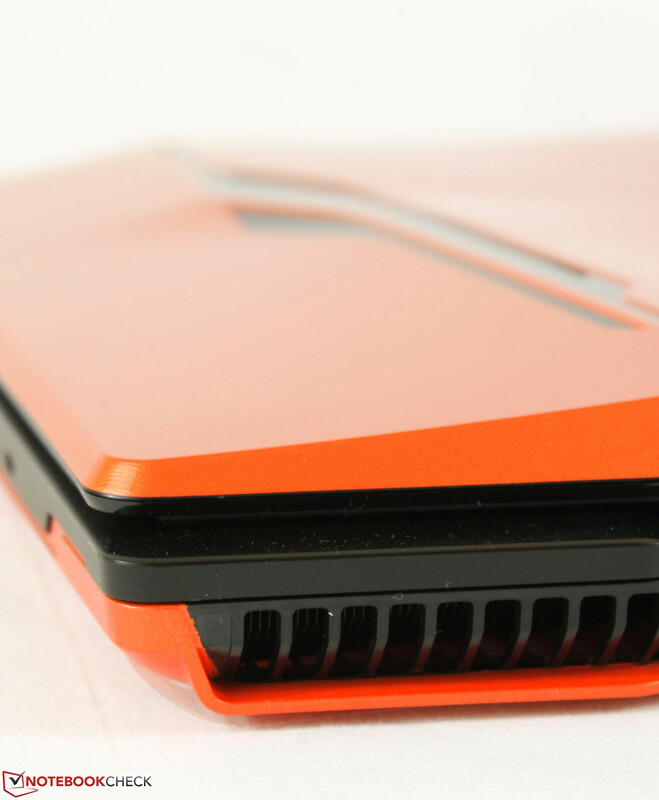 We give the edge to the Chimera over the Lenovo Y50 for these very reasons as the additional weight and girth of the Chimera can be justified over some of its thinner competitors. There are definite rooms for improvement especially in regard to its display. 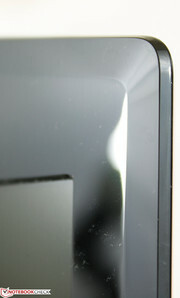 The AUO panel is average with unimpressive colors compared to the competition and the hinges could have been more rigid to reduce rocking when changing angles. There are also no other CPU and GPU options other than the i7-4710HQ and GTX 860M; It would have been very impressive to see an 870M as the current system fans and heat pipes already do a great job on existing components. 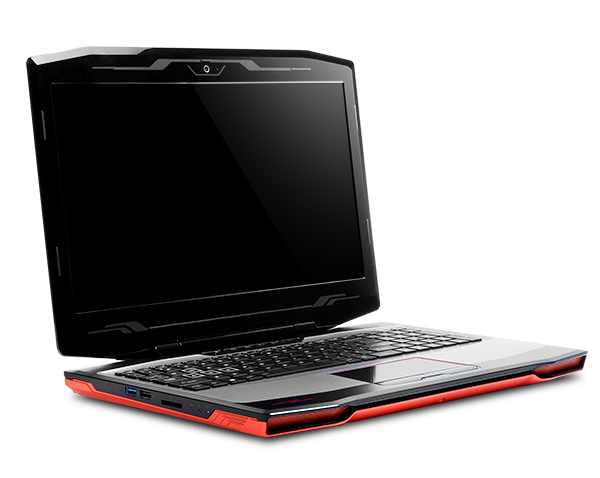 The 15.6-inch Eurocom X3, for example, offers a much wider range of GPU options due largely to its standardized MXM 3.0b slot. Users may also complain about the integrated battery, easily agitated fans, and heavy weight for the size, though these properties are less of an issue and should be expected from most high-end gaming notebooks. Lastly, the unusually high maximum display backlight deserves another mention. Most gaming machines fall in the 200 to 300 cd/m2 range as this is sufficient for most indoor situations, but the Chimera goes above and beyond this range. 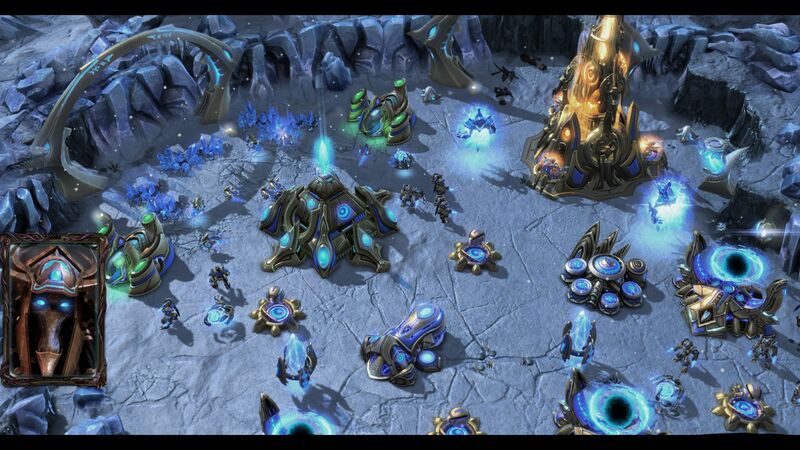 It's an advantage that most gamers will find probably see as a novel feature at best. The Chimera is a good alternative to the current crop of thin-and-light gaming models if users are attracted to the distinctive design and don't mind a larger footprint. Hopefully any future revisions will bring a higher quality display and a GPU update to the more recent GTX 9xxM series. 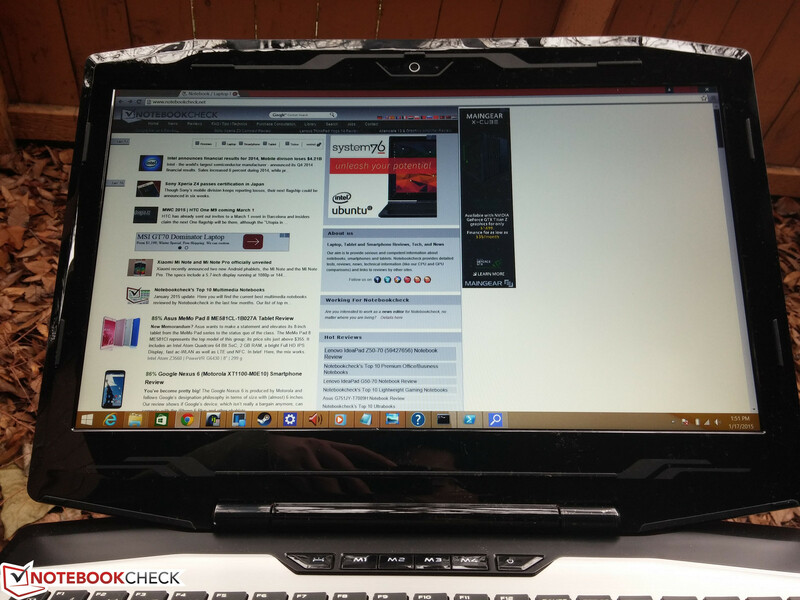 In Review: iBuyPower Chimera CX-9. 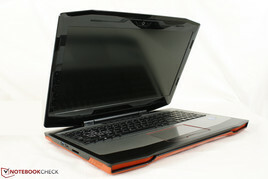 Test model provided by iBuyPower. Attractive design, responsive keyboard, 3x storage options. 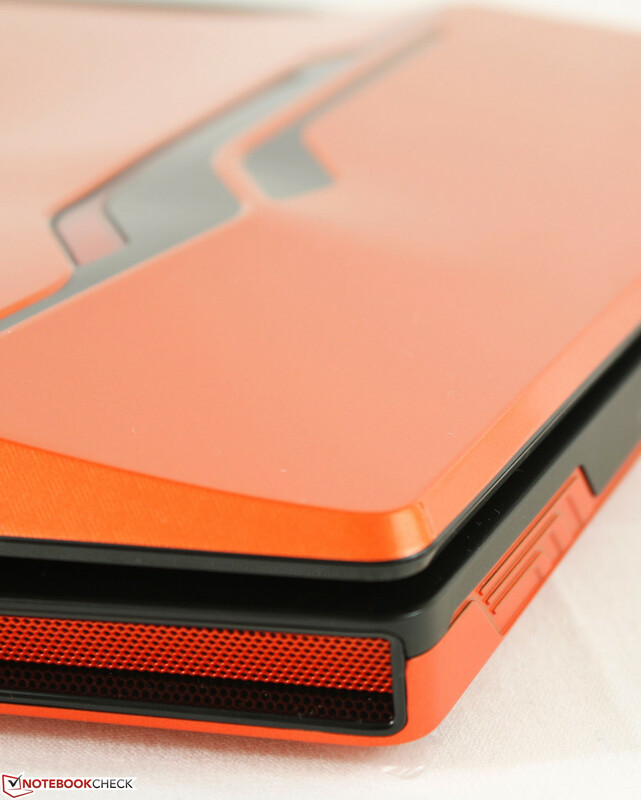 Better-looking than most larger gaming notebooks while offering good construction. Higher GPU options and a higher quality display. More color options would also be great.. A hot red glossy chassis would look even better than the current default orange! 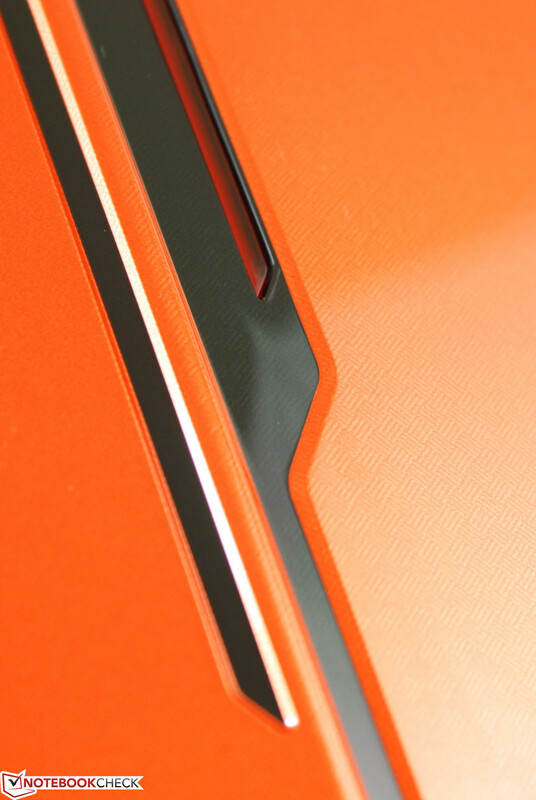 The orange colors work very well with the curved design. The many different types of surfaces meld well together without feeling out of place.